This particular model had the UR beats headphone set include with it, so that may be why it’s been selling like hot cakes. But anyway, here it is. Now, I want to mention that, with this phone, HTC’s managed to raise the bar, what with the quad core processor, a 4.7 inch HD screen, and running Ice Cream Sandwich out of the box. And all wrapped up in a very thin and light body. I’m really impressed with the design, by the way. So bear with me while I gush over it for the next minute or so. 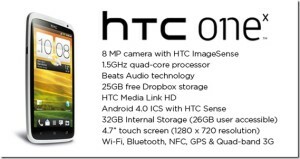 For the past couple of years, HTC’s been going for the smooth line, unibody look. And I think, in the ONE series phones, particularly the ONE X, they’ve carried it off in style. The chassis is made from a single piece of polycarbonate, which is a new material for HTC. It’s a more expensive type of plastic that’s lightweight and really strong at the same time. And it makes the phone feel very solid and durable. I like the way it’s rounded, and the smooth glossy sides. It’s a nice change from the rectangular form factor of a lot of other phones. From the side, it looks curved, like the Galaxy Nexus. But the glass actually lies flat on top. I think the curve of the phone helps it fit in the hand snugly. The polycarbonate also has a nice textured feel to it, which helps me get a good grip on it. Usually I end up having to buy a case for my phones, because they have such smooth, slippery surfaces, and I’m always terrified of dropping them. But I don’t think I’ll be needing a case for the one X. But, then again, I have to mention another thing. The white phone picks up fingerprint smudges and other marks pretty easily. I’ve needed to wipe it down with a damp cloth occasionally, so that might be a reason for getting a case in future. The One X weighs 130g, that’s 14g heavier than the Galaxy S2. But, practically, it feels really light in my hand, and I think that’s a great achievement for a 4.7 inch screen phone. It’s pretty compact. It’s not just slim, it’s compact overall for it’s size. If I compare it to the Galaxy S2, which has a 4.3 inch screen, you can see it’s only a few millimetres wider and taller. And again, it’s only 8.9 mm thick. Now, I’ve been able to use this with one hand for most things, so I think most people would be able to. The design of the phone is what really impresses me. It’s beautiful and very minimalistic. There’s a slimline volume rocker switch on the right. The microUSB slot on the left, which is for charging and data transfer. It also works as a Mobile High Definition Link to a TV. So with an MHL adapter you can play 1080p HD content directly from your phone on your TV. On the top of the phone there is the 3.5mm headphone jack, a secondary microphone pinhole, and a power button. There’s also a microSIM slot that can be opened using the metal sim-eject tool that comes with the phone. Or a bent paperclip will do the job too. On the bottom there’s just the microphone pinhole. One issue I’ve noticed is that if you’re right handed (like me), then the power button might be a bit of a stretch to reach if the phone is resting in the palm of your hand. Because of the phone’s size I have to shift it down in my hand every time I want to hit the power button. I find it easier to reach with my left hand, funnily enough. But, it’s something I could adjust to with enough use. 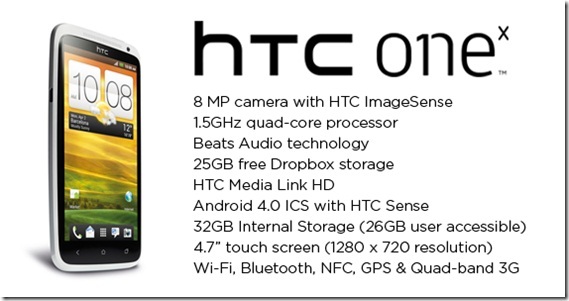 The back of the phone has the HTC logo in inlaid silver and a smaller beats audio logo above the speaker grille. There are five small dock connectors. And most notably, it does not have a removable battery. The battery is sealed into the phone chassis, and this may be an issue for some people. Also, it has no microSD card support. So you’re entirely dependent on the 32GB of onboard storage. Again, that may be an issue for some. Especially when you’re talking about storing HD movies, large games, and lots of music. I guess, these were necessary sacrifices for HTC in order to keep the form factor so slim and light. The most obvious feature on the back is the 8MP camera, and the LED flash right next to it. The camera sticks out a bit from the handset and that initially worried me because I was worried the protective glass over the lens might get scratched easily when I put the phone down on a table or something. But actually, because the phone is somewhat curved, the camera part is slightly raised up, and only the bottom edge of the camera seems to come into contact with the table. Also, there’s a nice silvery ring surrounding the camera, which I’m guessing is also scratch proof. When you look at the screen, it’s probably the best feature of the phone. What with it’s great use of space, thin bezel and the flowing waterfall like effect on the sides of the Gorilla Glass. Right above the screen you get the earpiece grille, and the 720p video call camera. Then the single piece of Gorilla Glass covers not just the screen, but also down over the three capacitive touch buttons. I actually prefer capacitive buttons to the onscreen contextual ones you find in the Nexus. It just means the controls are always there and there’s less jumping around of the buttons. But that’s a personal preference. The three buttons on the One X are the typical Android 4.0 ICS ones, namely Back, Home, and Multitask keys. They’re nicely spaced out and really responsive. The screen is large, 4.7 inch, and it uses Super LCD-2 technology. So it’s pretty bright and gives near 180 degree viewing angles. It also has less glare, so sunlight readability is good. It’s a 720p HD display with a pixel density of 312 ppi. And with that sort of sharpness on an LCD, you could almost forget that you’re looking at a screen. It’s like you’re looking at an actual picture at times. It doesn’t have the sort of contrast ratios that AMOLED screens have, so the blacks won’t be as deep. But, I think the LCD-2 gives a better true to life colour representation. Ultimately it comes down to personal preference whether you prefer an LCD screen or an AMOLED one. Since nowadays you can get both with excellent pixel density. When you switch on the phone, you get this wonderful lock screen. Just drag the ring up to unlock the phone. You can also open any of the four apps on the lock screen by dragging the icon into the ring. You can decide which four apps you want on your lock screen. There are seven scrollable home screens, but there is no endless scrolling as in some other devices. So, this means that once you reach the last home screen on the left, you can’t go any further and you’ll have to scroll all the way back to the right again. The same goes for the app drawer. You can see all your home screens in exploded view if you pinch in on any one of them. This is a quick way to jump to any screen you want. You can also add and remove home screens in this view. Being 4.7 inch, there’s lots of space on the screen for widgets and shortcuts. In typical layout, you’ll get sixteen shortcuts on one home screen. Four columns across and four rows down. I like this version of Sense. It feels less clunky than HTC’s previous versions, and seems to gel quite nicely with ice cream sandwich. It’s still Sense, and you don’t get the full look of Android ice cream sandwich, But this version, Sense 4.0, doesn’t go off on a tangent of its own and take you away too much from the core android experience. You get all the new ice cream sandwich features. There’s still a load of bloatware. Lots of preloaded applications like HTC locations, and movie editor that I could do without. So hopefully the next version of Sense will be stripped down even further. Another thing to mention is Dropbox. This is an online cloud storage service where you can store your files, photos and such, and access them from any device linked to your dropbox account. Basic membership is free with 2GB of storage space. Then the next level of membership gives you 50GB of storage space for around $100 or £60 a year. HTC has partnered with Dropbox for it’s One series of phones, and you’ll get 25GB of storage free for two years. This is good news, since the phone’s internal storage capacity of 32GB can’t be expanded. Next, the capacitive keys. They’re the same arrangement as in the Galaxy Nexus, But I’m still getting used to these, as I’ve been using other android phones for the past few months. The Home key is in the middle, but the Back key has been moved to the far left, where I’m more used to having the settings key. Settings has actually been moved to the notification bar, where it has it’s own menu key. So stretching over to press the back key on the left is taking some getting used to on this large screen. I keep pressing the key on the right of the home key thinking it’s the back one, but it’s actually the new multitasking key. It’s quite a handy new ice cream sandwich feature. You get a graphical list of all your open applications, so you can jump from one to another rather quickly. You can also close any applications you don’t want by just flicking them up and away. This is the quad core version of the One X, with a quad core 1.5GHz NVIDIA Tegra 3 processor and 1GB RAM. It’s quite smooth and fast while browsing, playing games, and just flicking through homescreens. Overall, The phone seems to handle resource intensive tasks and multi-tasking quite easily. I’ve run the standard benchmark tests on this phone, And you can watch that video, The link is here. It’ll give you an idea of it’s overall performance. The One X has an 8MP camera on the back and a 1.3MP front camera. With the rear camera you can take 1080p quality video, And the front camera gives you 720p quality video. The rear camera’s been getting a lot of press, Especially since HTC claim that it’s the best they have made to date. And the few pictures I’ve taken with it so far have come out with good detail. Close-up macro photos won’t beat those from a dedicated camera, but they’re still good enough for everyday use The phone actually has a fifth imaging processor for the camera, So you can take multiple quick shots in a row. HTC calls this a “burst mode” where you can take 10 shots per second. It has continuous autofocus, so it keeps latching onto any object in the front. This is useful since the phone doesn’t have a dedicated camera shutter key. But it doesn’t give you all that much control, since you’ll have to tap and hold on the spot where you want it to focus. There’s also face and smile detection. And the software gives you lots of manual settings like exposure levels, white balance, and ISO. One feature I’ve found myself using a lot is the ability to take photos while recording a video. You can record decent HD quality video with stereo sound. I didn’t notice that the quality was noticeably much better than many of the phones currently on the market You can also record slow motion videos. So that’s something to have a lot of fun with. I’ve found that call quality on the One X is quite good. I’ve not yet experienced any problems with connection, even if the phone was only showing two bars for signal strength. In-call quality was clear, no problems there. I liked the smart dial feature, which works like predictive text. So, if you quickly typed in 020, it brings up all your contacts with a phone number starting with 020. Same with names. Type in LUC and you’ll get everyone you know whose name begins with LUC; Lucy, Luca, so on. It’s a feature that’ll definitely save a lot of time. Web browsing on the One X is quick, with even the image heavy websites loading in no time. Having the large screen has meant that I can look at the desktop versions of most sites. I really don’t like some of the mobile site versions out there. The large HD screen shows a lot of detail, so you can quickly skim over any website and get an idea of the content without having to zoom in initially. You will need to zoom in to read normal sized text though. There was an issue with the text reflow on the stock browser, Where, if you pinch to zoom in and then release, the text jumps about as it reflows and comes into focus. This isn’t a hardware issue. I tested out a few other browsers that you can download from Google Play, like Chrome, Opera, and Dolphin And none of them had this problem. So, if you are getting that jumping around on the stock browser, just download another. I think the processor does a good job of handling heavy websites. I also played some flash videos on the phone and didn’t see any lag. But, I did notice that simple web browsing drained a bit more battery than even watching a movie for the same time did. Games look beautiful on the One X screen. Especially the so-called tegra 3 optimized games. It’s super bright and highly detailed. But other than the looks, the actual experience of playing the game on the One X felt no different to playing it on a dual core phone. I don’t think the full power of the new quad core is being used by any of these games. The big downer for gaming is the battery. It drains pretty quickly. Ten minutes of playing a tegra 3 optimised game brought the battery down by 7 percent. The phone also heated up slightly around the camera region, but that was similar to other phones. The battery is an 1800mAh (milliampere-hours) Li-ion battery. It’s sealed into the phone chassis, so it’s not swappable, and battery life becomes a huge issue. The biggest battery drains are obviously the high resolution screen and the processor. I found that playing games, watching movies, making calls, and browsing the net all quickly sucked up power. A day of medium usage saw the phone last seven hours on the battery before it needed to be charged again. I was able to play a non-HD movie continuously for 4 and a half hours from full charge until the battery died. And ten minutes of playing a tegra 3 optimised game drained the battery by 7%. When it comes to music, the biggest factor is the Beats Audio integration. On my model, I got a pair of UR Beats headphones included and I was able to test them out. Now the Beats integration is only a software tweak for the phone. And it only works when you have headphones connected, and not if you’re using the loudspeaker. I think beats enhancement will come down to being a personal preference. It does give a much deeper sound to the music, especially the bass, and you can really tell the difference if you toggle the setting on and off. I quite liked the effect and I found that the beats headphones enhanced the depth of music even more. But after trying out the beats enhancements with different headphones, I found that the beats headphones didn’t offer enough off a difference to justify running out and buying them if you don’t get a pair included with your phone. You do get a choice of different sized ear plugs with the beats headphones, so should be easy to find your size. But the remote control section of the headphones, this one, is low down, right at the junction where the cables split. This could be awkward if you’re answering a call while listening to music, You’d have to hold the remote up closer to your mouth. So what’s the point? In the end I actually settled for the ordinary headphones that were included in the phone box itself. I found they were good enough, and quite comfortable to wear. Also, the microphone is on the right hand side cable, so closer to your mouth. Interestingly, if you go into the sound enhancements menu where you turn the beats audio on or off; There’s a drop down menu at the top where it lets you specify which type of beats headphone you are using. Even if you’re using a non-beats headphone, select the Beats Pro or Beats Studio option. I found this gives a deeper sound even with the ordinary headphones. So the One X is a stunning phone. It does everything really well. And at the moment, it’s unmatched for specs and design. It’s future proof, at least for a good while. The lack of microSD support is going to be an issue for some, But if you can live with 32GB of onboard storage and 25GB of cloud storage, Then this may be the phone for you. Really, my only issue with this phone is the battery life. It’s not a break or make issue, I think, since it just means you will need to top-up the charge in the early evening or so. There are a few ways to get more out of the battery, An obvious one being to be frugal with your use of the phone. It’s difficult to do with such a powerful phone and awesome screen that’s just crying out to be used. But ultimately I think the choice of whether you get this phone or not comes down to whether you can adjust to the battery life or not. I hope this review has given you an overview of the HTC One X. I will be posting my five days user experience review soon, Where I’ll be testing the phone for things like battery life, and looking into other issues with the One X that affect it’s daily use.